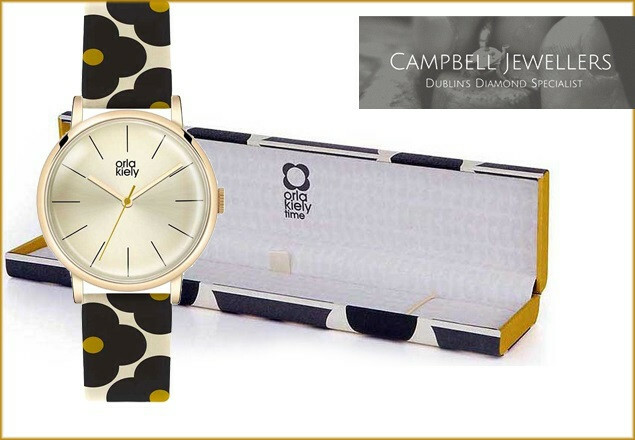 A twist on the brighter Orla Kiely Time pieces, this darker design is still eye catching and trendy. A clear gold analogue dial is the centrepiece of this watch. The large 38mm display uses quartz powered three-hand movement and is framed by a stainless steel gold plated material. With the traditional and globally recognised Orla Kiely flower print featuring on the strap in undeniably sixties colours of black and mustard. The multi-coloured strap is made from genuine leather and uses Orla Kiely flower print in black and mustard to bring life to the 19.5cm length which ends with a buckle clasp fastening. The polished pale Hamilton gold case looks very elegant and features a pale gold sunray dial. You must place your order by Friday 11th May 2018.